The laptop or notebook computer is rapidly replacing the standard desktops for many users. The power of these small computers is now able to rival their big brothers. A new class of such machines is becoming popular, the portable workstation. Case in point is the Gateway M675CS. The M675 is the top line of Gateway notebooks with the CS basic model at the lowest of the three rungs of this series. Don’t let its relative position fool you; this is a powerful machine that will exceed almost any use you have. The fundamental difference between the CS and the higher end X and XL models is the screen size. The CS has a 15.4" screen where the other two models come standard with a 17.1". Personally, I need a computer that has enough power to manage a fairly large database and allow me to telecommute to work. I have used several other laptops and they run out of steam within a year, unable to meet the demands of my growing projects. I see a long and happy future with this laptop. The first thing that you will notice is this is larger than most laptops. You find out why when you pop open the lid on this notebook computer and take a look at the keyboard. Unlike every other notebook keyboard there is a fully integrated 10 key numeric pad to the right of the main keys. This feature that has been standard on desktop units for some time now comes to the portable. If you do a lot of numeric entry this is a must. It also makes a lot of games a lot easier to play, as my teenaged daughter pointed out. The status lights are very modern blue neon. The screen is also different; the monitor has a 15:10 aspect ratio similar to most high definition televisions. The input jacks and drives are distributed on the back and both sides. In fact, there are UPC jacks on all three locations for easy connection to your other devices. While is appears that the fast access buttons cannot be user defined they are useful. Above the keyboard is a large power switch and access to email, your browser, the main Windows help page, My Computer (in browse mode) and wireless on/off. At the front edge of the unit are controls for the DVD and media player as well as the usual indicator lights. The battery light is purple when the battery is charging and changes to neon blue when full. There is even one light for writing to the CD as well as reading from it. The cooling fan is nice and quiet, it is barely audible. On the other hand the CD drive was very noisy when reading a disc. Several of my installation discs just refused to read. To be honest they where burned rather than from the factory. I also found that several of my legacy programs did not work. Some of these programs have been ported over the years to many PCs with operating systems ranging from Microsoft ME, NT and both XP Pro and Home editions, yet they refused to work here. While this is not a big problem for most, if you have some older programs, especially those created with Visual Basic, be warned. The battery it is a high- capacity lithium ion battery which is rated at 14.8V/6300 mAh and comes with an AC pack. Only one battery can be in the unit at a time and since the CPU draws a good amount of juice the life span of the charge was just about two and a half hours. The battery is loaded from underneath saving valuable side real estate for the input/output ports. While in battery mode the screen does dim to conserve power. The downside here is it dims just a little too much for comfortable viewing. Both the left and right side drives are hot swappable and easy to remove one you get the knack. There are little catches underneath the machine, slide them to the side and you can rapidly replace the 3.5" floppy/memory card reader or the CD/DVD drive. This adds to the versatility of the machine and provides an easy upgrade path. Some of the touches that demonstrate this machine is for the power business user is the inclusion of a printer port and a gigabit Ethernet. Just plug this in at work and you are ready for anything. When you have that all important presentation to make the S-Video jack will make set up a breeze. The full size keyboard with complete numeric entry keys will make data entry a snap, finally a Num-Lock on a notebook keyboard that you will use on a daily basis. Sure there is a bit of a learning curve for your fingers, especially if you are used to the typical notebook keyboard but the benefits far outweigh any inconvenience. Considering this machine has a full scale hyper threading CPU it is remarkable cool and efficient. Even after many hours of use there was no discernable heat generated. The basic model of this notebook comes with a good selection of pre-loaded software. There is Microsoft Works version 7.0, a trial copy of Norton Internet security and for you DVD collectors out there the very popular WinDVD. For use with DVD-ROM content they also include InterActual .One great touch is the inclusion of PC-Doctor, a program that completely scans your machine for problems and fixes whatever it can. There is a driver update program that connects to the Gateway FTP site and makes sure you have he latest drivers. Use this one with caution, it everything is working don’t mess with it. For your multimedia needs there is Real, Quick Time, Windows Media player and MusicMatch juke box. Another potentially dangerous program is WinPhlash, a program that can backup and update your BIOS. Only use this if you are told to by a certified technician. You also get the basic version of the Roxio CD burning software. Typically, most of the software provides links to purchase the full release versions. Financial tracking is provided by the basic version of Quicken 2004. Adobe 6.0 comes pre-installed. The standard CS model comes with a Pentium 4 2.8 GHz CPU. This CPU employs the Intel Hyper Threading technology which greatly improves the ability to multitask two high demand programs. You can also order the CS with either the 3.0 GHz (add $130) or the 3.2GHz (add $330) processors should you need even more computing power. 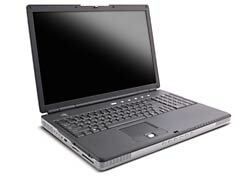 Included in this model is the ATI Mobility Radeon 9600 8X AGP with 64M of dedicated graphics RAM. This is a state of the art graphics processor that will handle almost any task you put to it. Considering the constraints of size, power consumption and heat generation inherent in such a chip the design team for this chip knew what they where doing. This card is fully compliant with the Direct X 9 specifications with quad rendering engines, dual vertex engines, 16 textures per pixel and 12 shade ops per clock tick. These are impressive sounding specification but even more impressive to actual see. With the larger 17.1" screen you can opt for 128M of dedicated video RAM. This is really on needed if you are planning on using the system for a lot of graphic intensive games. The CS comes standard with a 40G hard drive but for an additional $80 you can move up to a 60G drive. The controller card uses Ultra DMA utilizing PIO mode 4 with 100 MB/s maximum data transfer rate. The Ultra DMA which supports burst mode data transfer rates of 33.3MBps. This is twice as fast as the previous disk drive standard for PCs. Standard with this series is an ‘EZ’ touch pad. Now I’m not a big fan of touch pads, but this one is fairly accurate and follows the finger tip better than many others that I’ve worked with. There is an optional optical mouse available. It uses a USB connection but with four USB 2.0 ports there are still enough USB ports for your other devices. The optical mouse is extremely accurate, fat more so than the old fashion ball mouse. It also has a wheel between the two buttons that permits easy scrolling and when pressed puts you in a fast movement mode that zips around a page with the slightest hand movement. The optical mouse is symmetrical, great for lefties like me. Unfortunately, there is no installed PS/2 mouse port. About a month after I received the portable workstation I received a surprise package from Gateway. It contained a port replicator. While most external connections are possible directly to the laptop the replicator provides additional connections. The replicator is basically a bar just a little wider than the laptop itself. A little ledge in front of the unit contains a connector that fits into a slot on the bottom of the notebook. That's about it for physical setup, just slide the notebook on the replicator, listen for a little snap and you are set. To release it just push a latch on the replicator and the notebook pulls free. Among the additional connectors there is a lot of attention to multimedia. There are five universal jacks present. They can be configured for front, center, rear surround and sub woofer speakers. One of these jacks can be configured for a microphone. The normal two USB ports on the notebook are increased to three. There are jacks for a PS-2 mouse, an external keyboard and external monitor. There is also a S/SDIF Toslink digital audio jack for full six channel audio. Of course you still get to keep the normal parallel, modem and 1000/100/10 Ethernet connectors. With this unit in place you truly have a portable workstation. Best of all there was no additional cost for the replicator. With many notebooks there are only two USB ports. This model comes standard with four. Considering you have to use one for the optional optical mouse this leaves three for the many devices you will want to add to your computer. The USB ports are conveniently located on all sides of the unit making connections fast and easy. Since it uses a wide screen display more room is afford the keyboard. Once you get use to it the key board is very easy to use, normal size keys that help prevent typos. The video was excellent. Even in full screen mode I could watch a DVD without any noticeable artifacts. The response was smooth and clean. The same held true for streaming video. The over all design of this notebook gets very high marks. Even in the basic configuration comes with more power than required for most uses. Between the ultra fast hard drive and speedy video card this machine is responsive. You’ll be able to get going in only a few minutes once you get it out of the box. The notebook computer itself had almost no drawbacks itself. The only ones I saw was making the 3.5" floppy drive optional. While this may be a popular path for notebooks, many times it is advantageous to boot from an emergency floppy, typically created by such rescue programs like Symantec Utilities, McAfee Anti-Virus and Powerquest’s Drive Image and Partition Magic. When all else fails its nice to have this option. The only other problem I had was with Gateway’s shipping policy. There is no express delivery available for notebook computers and the date they official give for shipping is two weeks after you place an order. For those that depend on a laptop for work and need a replacement fast this can be a problem. Any extras ordered may be shipped separately and there is limited online tracking but that is more due to the carrier than Gateway. When you ask for the status of the order all you get is the estimated shipping date. One reason for this is many of their notebook computers are shipped from China so although my machine got to the States in a day it was held for several days with a customs hold on it. The touch pad is not recessed quite enough and your hand tends to brush against it moving the mouse where you don’t want it. Picky I know but it can get annoying real fast. The built in speakers where tinny, there was very little in the way of low frequency reproduction. The Gateway M675CS is more than a notebook, it is a portable workstation designed with legitimate power. It’s not the type of machine that is well suited for a trip on an airplane but rather far better suited for moving between office presentations or using as both you office and home machine. The hyper threaded CPU is intended for power not battery conservation. Unlike the typical Centrino CPU most laptops have the brains behind this machine are for heavy duty professional programs. Since the target audience is for power users it is a wonder that Gateway does not offer Windows XP Professional as the default rather than a somewhat costly extra. When you are not hard at work the Radeon 9600 will give you more than enough detail and resolution for any game or DVD. Only a high end video card like the FireGL AutoCAD could beat it and for most people that would be over kill. One thing you really can't judge when you first open the box of your new computer is what kind of support does the company provide. I opted for the extended warrantee since my last few portable died within the year. While the cost for this extra protection can be several hundred dollars it is well worth it. About a year after getting my new Gateway I started to get some blue screens and an automatic reboot. This was little more than an annoyance, it only happened a few times a week so I tried to work around it. Then, about 16 months into the life of the machine it just shut off and would not boot up again. I called Gateway support and the technician arranged for me to send my machine in for repair. The next business day a pre-paid box came and I shipped the machine back. Just over two weeks later it returned after a BIOS problem was resolved. They also discovered a problem with the fan and the memory and replaced those parts as well. The unit was returned without the battery and with the wrong memory so I called support again. Gateway sent out a new battery followed in a few days with the correct memory. All of this failed to fix the blue screen problem so I called again. They arranged for a new machine to be sent out immediately. Normally, their policy requires a machine to be in for service three times before a replacement but they waved that in return for the hassle of the missing parts. Before approving the replacement they did ask me to make sure it was a mother board problem by running tests on the hard drive, something that erased my files and then rebuild the operating system and OEM programs from the supplied CDs. After that failed to correct the problem the new machine was sent right out. The technician I spoke to even called on a Sunday afternoon to let me know the replacement was on its way. The new machine came and all I had to do was swap out the floppy, DVD and hard drive and I was back up and running. While there was some frustration to the whole process the result was about a month after reporting the problem I had a brand new machine.